Pontoon is often considered an earlier form of blackjack; a simple yet entertaining variant, with a host of player friendly rules. This article is about the British blackjack card game variant called Pontoon, and not about the variant of the American game Spanish 21, which has a very different set of rules and is commonly played in Australia, Malaysia and Singapore. Where to play Pontoon online and offline? Limited brick and mortar casinos within Australia offer the game of Pontoon as described above, but if you venture to the online realm of gambling, you will find ample licensed, legally accessible and secure casino sites offering this game, with betting limits as low as $0.50 and as high as $10,000 (and more for high stakes players). Guts.com and GDayCasino.com are the two AUD-friendly gambling desktop and mobile websites we recommend registering accounts with in order to play real money Pontoon. Pontoon is typically played with six to eight complete decks, but some versions can be played with two decks (two deck versions enjoy a 0.35 per cent lower house edge). All cards hold the same value as they do in blackjack – number cards 2-10 count as face value, Aces can be used as either a value of one or 11, and Jacks, Queens and Kings are valued at 10. Pontoon – any hand of an Ace and any 10-point valued card (includes after splitting). A five-card trick – a five-card hand that has not busted. A non-busted hand – a hand with a total value of 21 points or less (with four or less cards). Hands are ranked according to their total values (the closer to 21, the stronger the hand). A busted hand – a hand with a total value of 22 or more points. Unlike traditional blackjack, the dealer does not show either of his/her cards. All players are dealt two face up cards, while the dealer receives both cards face down. Before the round begins, the dealer will check if he or she has Pontoon. If the dealer does have Pontoon, all cards and player wagers are immediately collected, so no player has the chance to lose more money to a hand which will already beat yours. Pontoon utilises slightly different terminology to traditional blackjack, so it is important to understand what each term means before playing. Buy – double your bet to draw and additional card (allowed with four cards or less). After buying, you can twist again. Typically, only one buy is allowed per hand, including split hands. Splitting in Pontoon is essentially the same as splitting in blackjack. If your first two cards are of the same value, you may split them into two separate hands. You need to double your bet in order to do so, and you can then play both hands, one after the other (one card automatically dealt to your first split hand, then you play it out, and so on). 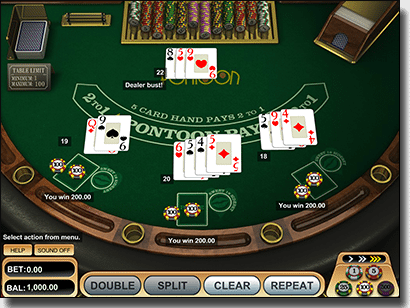 Pontoon typically allows just the one re-split (splitting once again after already having split) – thus, the most hands you can play from splitting is three. The game does allow you to re-split Aces (very beneficial to the player). You can also split unlike 10-value cards (for example, you can split a King and a Jack). If splitting, you can choose to buy once for each split hand, and can subsequently twist after buying. In most games, a split hand which results in a two-card 21 counts as Pontoon. If the dealer does not have Pontoon, players can now play out their hands by either twisting, sticking, buying and/or splitting, depending on what he or she has. The player cannot stick on a hand total less than 15. A hand with a total value of 15 or more allows for a player to stick. As soon as you go over a total of 21, you forfeit your wager and that hand is no longer live. If you have a Pontoon and the dealer does not, you win that hand regardless of what the dealer ends with. If the dealer has 16 or less, he or she must continue to twist. The dealer will stick on a hard-17 total, and twist on a soft-17 total. The dealer will stick with a five-card trick. The dealer will stick with a total of 21. After the dealer has finished playing out his or her hand, each player compares his or her hand/s with the dealer’s hand and whoever has the higher total, wins. In Pontoon, the dealer will win all ties (player loses). What is Pontoon’s house edge? Following all the above rules to a tee, this variant of Pontoon has a house edge of 0.34 per cent (theoretical player return of 99.66 per cent), making it one of the best variants of blackjack (or 21) to play. A split hand with an Ace and a 10-valued card is not considered Pontoon – this increases the house edge by 0.49 per cent. The dealer sticks on a soft-17 hand, rather than twisting – this decreases the house edge by 0.47 per cent, but is rarely found. The player only receives one additional card after splitting two Aces – this increases the house edge by 0.49 per cent. The most commonly altered rules in online games of Pontoon are the ‘one card only after split Aces’ and sticking on a soft-17 hand. Typically, if the player is allowed to draw more than one card after splitting Aces, then the dealer will twist a soft-17 hand, and visa versa. Basic strategy does exist for games of Pontoon, and is based on how many cards the player has, and what the hand total is. You cannot base your strategy off what the dealer has, as that is unknown until after all players have completed their turns. To view the best Pontoon guidelines, you can view our basic strategy page here. A few important rules to follow include: always twisting with a four-card total of 17, always buying with a two, three or four-card total of 10 or 11, and always sticking with a two, three or four-card total of 18 and above.